Yoga DVD: One thing that can be hard for a little yogi is finding something that holds their focus. Yoga poses come naturally to kids until you ask them to do the pose. That is when you or someone else who is helping guide them on their yoga journey to find creative ways to help them find the poses. The DVD allows them to not only see an adult doing the pose, but other children. Sometimes a childs best teacher is another child. My kids found the DVD to be fun and a great addition to their yoga collection. Sometimes we use a DVD guide, sometimes I guide, and sometimes they take on guiding themselves to find a few moments of calm in each pose. Yoga Mat: In the past when we have done yoga it has always been on the floor or grass with our bare feet for safety. When my daughter was an infant and I was in Yoga Teacher Training she would, on occasion, come with me and play/sleep on my mat while I went through different postures, lectures, or whatever was going on in class that day. You can say in a way she cut her teeth on a yoga mat literally. Since she has been big enough to do her own yoga flows however she has been mat free. So, it only seems fitting to have the kids try out a yoga mat of their own. This mat is set up perfectly for kids. It is soft on the skin. It offered great cushioning making the occasional slipped pose an un-painful slip. It also gives them their own space so that they aren't going into each others area when practicing and creates boundaries for others not practicing so as not to interrupt the practice. They loved that it had pictures of the poses and this worked well for their personal journeys to find moments of calm. They took turns pointing to poses and then trying them out on their own. 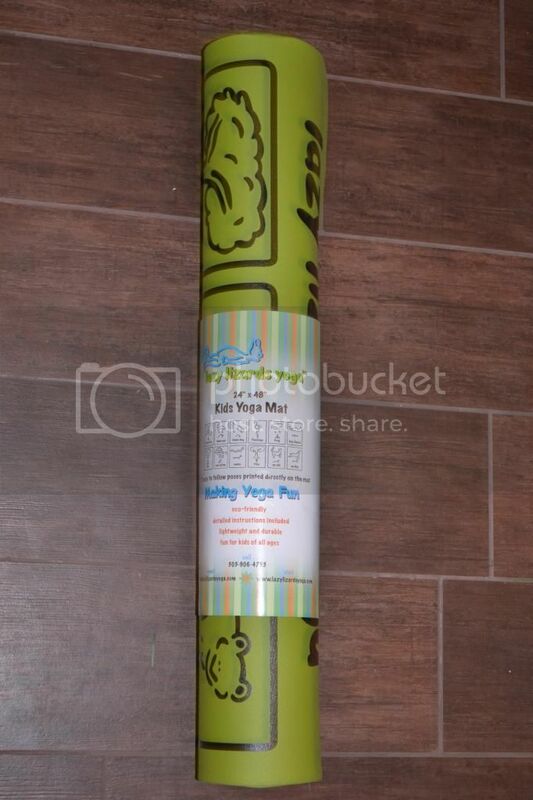 Kids love to be independent and this mat helped give them some independence in their yoga practice. They also loved that they had their own mat instead of using mommies mat, they get to pull out their own! Check out the kids finding their moments of calm, exploring their own private practices despite the chaos around them! Love all the pics. The kids look like they are having fun copying the poses on the mat.